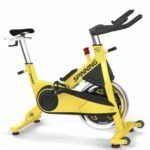 The Spinner Johnny G is one of the spin bikes released in 2017 but it’s still available today and comes with a SPINtv subscription. It’s similar to the Spinner P1 trainer but has a slightly lower weight capacity and two bottle holders rather than only one dual-slot bottle holder. It’s an authentic Mad Dogg Athletics spin bike, but as opposed to other models, this one is designed for home use, not commercial use. For reference, this is the Spinning bike part number 10-038. Even though the Spinner Johnny G is not an exercise bike designed for commercial use, it still features a heavy-duty construction with a weight capacity of 300 lbs (136 kg). Most of its frame is made of steel, the only exceptions being the chain guard, the brake pad guard, and several other small covers. As opposed to other models of the A series and P series, the Johnny G bike features a yellow paint finish with the “Spinning” logo painted black. The seat post, the handlebar post, and the flywheel have a chrome finish for superior aesthetics. The bike has the same dimensions as the Spinner P3 model. It’s 49″ (124 cm) long, and 20.5″ (52 cm) wide. This being said, it should fit a usage area of at least 70″ x 60″ (178 x 152 cm). Also, its highest point is given by the top of the handlebar which reaches approx. 42″ (107 cm) above floor level. The fully assembled unit weighs approx. 116 lbs (52.6 kg) which is more than twice the weight of most road bikes. All this weight plays a very important role in the bike’s stability. Also, its stability is enhanced by the four adjustable and rubberized levelers found on both its base bars. The bike does not have a folding design, so you cannot reduce its dimensions for storage unless you take it apart. But on the other hand, its front base features a set of large, rubberized wheels which considerably facilitate its relocation. By using these wheels to relocate the unit, you will only be handling approx. 30% of its total weight. Last but not least, the bike’s frame features a steel bar that connects the seat tube with the main oblique tube. 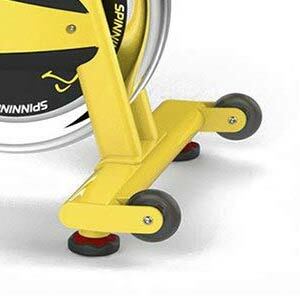 This tube can serve as a step-up element for taking position on the seat, stretching, or various spin workouts that require you to step-on and step-off the frame. Not all indoor cycling bikes have, so this is quite a plus. 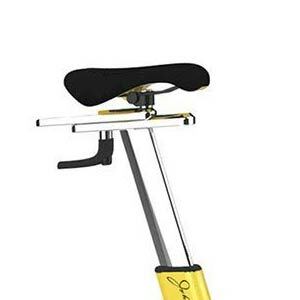 The Johnny G spin bike includes a spin saddle with a rounded and slim top. Evidently, this seat is not made for super comfort and does not have the cushioning of other bike saddles, such as the one included with the Sunny SF-B1709, for example. But on the other hand, since this is a spin bike, for at least 25%-30% of each workout you should be pedaling while standing up. The saddle does have a standard, collar-based attachment system, though. This being said, you can always replace it as the bike is compatible with various other seat bike models. You can also increase the comfort of the seat with a gel cover. The bike’s seat is four-way adjustable (front, back, up, down). Its upright post features plenty of adjustment positions while its horizontal slider also makes available a few inches of front to back adjustment. This being said, the bike can accommodate users between 5’0″ and 6’5″ (153 – 196 cm) with no problem, promoting a complete leg extension. The bike’s handlebar is only two-way adjustable (up, down). It does not have a horizontal slider as the seat. It features a multi-grip design with longer side grips and a short loop bar at the center which offers the possibility of a close aero grip. The handlebar does not integrate pulse sensors and the bike itself is not equipped with a pulse reading function. It also does not include an exercise meter. However, it does include two bottle holders, one attaches to the loop bar at the center of the handlebar assembly, the other attaches to the main frame tube. 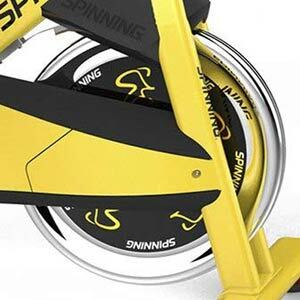 The Spinning Johnny G indoor cycling bike is equipped with a 40 lbs (18 kg) flywheel which has a perimeter-weighted structure. This type of flywheel promotes an aggressive inertia and a consistent pedaling feel, perfect for spinning workouts. The flywheel is chrome-plated with two black ABS side covers. The bike does not offer the possibility to coast like on a road bike; however, pedaling in reverse is possible. When pedaling in reverse, you will get the same pedal tension, though, given by the level of friction the brake pad applies onto the flywheel. Like most other Mad Dogg Athletics Spinning bikes, the Johnny G features a friction resistance system. Its main resistance element is a leather pad connected to the tension knob on the main oblique frame tube of the frame. In order to increase the resistance, you have to turn the knob clockwise so that the leather pad will apply more friction to the flywheel. The tension knob does not have any pre-determined resistance levels, or “clicks”. You simply tighten it until you get the satisfying level of resistance. As a general idea, you can tighten it up to the point you can barely pedal. Also, the tension knob functions as an emergency brake. You can press it all the way down to stop the flywheel if necessary. The bike’s drivetrain uses a chain. This being said, the transmission requires periodic lubrication. Evidently, the main pluses of a chain drive system are durability and availability. With proper care, the bike’s chain can last a lifetime. Also, it’s basically a standard bike chain, so in case it catches rust or somehow breaks, replacements for it are widely available. Since it’s designed to support any spin workout, the Johnny G bike is equipped with a heavy-duty crankset. Its crank arms and pedals can support users up to 300 lbs (136 kg) with no problem. The crank arms are made of solid steel alloy featuring a black paint finish, while the pedals are also metallic. The pedals are dual-sided; on one side, they’re equipped with adjustable toe cages, while on the other side they have special clips for spin shoes. Also, the pedals have standard 9/16″ threads, so you can basically find replacements for them in every bike shop if it’s the case. The Johnny G spin bike does not include an exercise meter but does come with several accessories. As we’ve mentioned above, it has two “gravity-based” bottle holders, one for the handlebar, the other for the main tube of the frame. The bike includes a set of four DVDs with spin workouts. In case you’ve never been to a spin class before, the workouts on them are quite educational, motivational and entertaining. They’re quite great to train with. They actually generate the atmosphere of a real spin class, and will considerably help with your results. The DVDs include Ultimate Energy, Train and Tone, Turn and Burn, and Maximum Results workouts. Finally, a 1-year subscription to SPINtv is also included with this exercise bike. SPINtv is an online library of instructor-led spin workouts which you can stream any time you want on your tablet or smartphone. The main body of the bike with the flywheel, brake elements, chain and several other parts comes pre-assembled. You only have to attach the base bars, the seat post, the handlebar post, the seat, the handlebar, and the pedals. This shouldn’t take more than 20 minutes. All the tools required for the assembly are included. Also, the manual provides step-by-step assembly instructions. For maintenance, it is recommended to lubricate the bike’s chain every few months with oil-based or silicone-based lubricant. Other than this, you only have to keep the bike clean, and periodically re-tighten any loose parts if it’s the case. All the tools required for the assembly are included. The Spinner Johnny G is a heavy-duty spin bike designed for home use. It features a durable steel frame which can support users up to 300 lbs. It’s equipped with a 40 lbs perimeter-weighted flywheel, dual-sided SPD-compatible pedals, and a 4-way adjustable spin seat. It can support any spin workout, being an excellent trainer for interval workouts, high-intensity cardio, strength and stamina development, and weight loss. Finally, like most other Spinning bikes, it is not exactly cheap, but does offer great quality for the price.